Mr Afolabi to hold another Facebook video Live chat on Monday and as usual, we are going to share the live video chat here on this blog with you. So stay tuned. 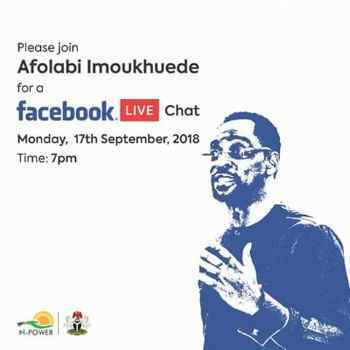 N-power volunteers are required to Join Mr. Afolabi Imoukhuede for a Facebook LIVE chat on Monday, September 17th, 2018 at 7pm. He will be discussing all your important questions.